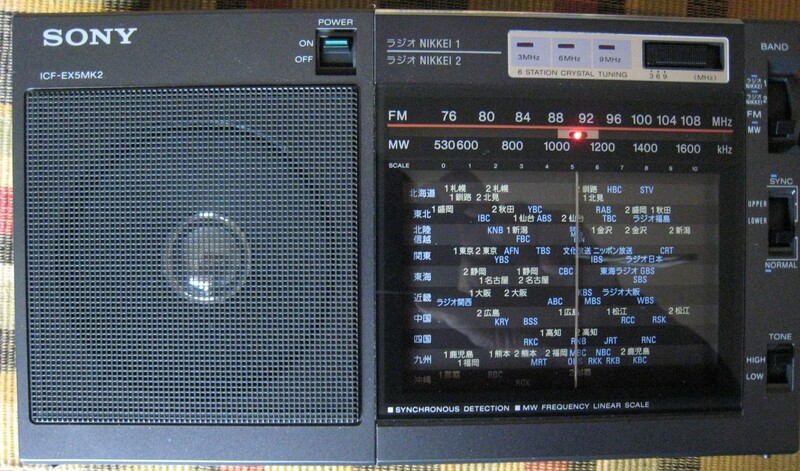 The Sony ICF-EX5MK2 is an unusual portable radio in several ways. There is considerable mystique and perhaps some misunderstanding surrounding it as it is intended for the Japanese market, which helps explain why so few of us here in the U.S. have ever seen one, even though we’ve been reading bits and pieces about it for years. The original model hit the market around 1985, and the current MK2 version came to market in 2009. The MK2 update dispenses with the analog TV band and adds an unusual and phenomenally excellent synchronous detection circuit. ..there were said to be other improvements as well. It is still available as of late 2018, but skyrocketing prices suggest they are becoming harder to find new. 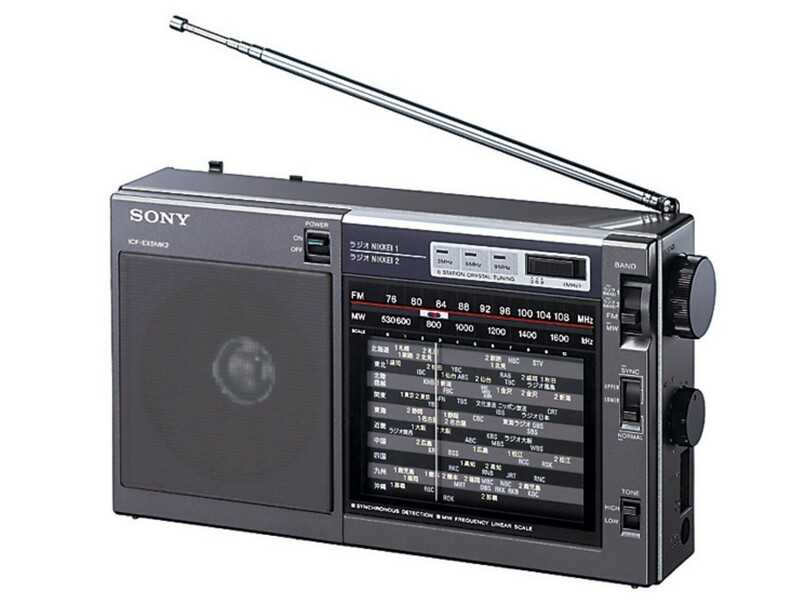 It is also the only radio I’ve ever seen in which the shortwave bands will be useless for anyone outside of Japan, as its SW is limited to 6, crystal-controlled, switch-selectable, non-tunable SW frequencies. These are tuned to the 6 Japanese NSB shortwave frequencies of Radio Nikkei, a domestic, commercial broadcast service for Japan, known as NBB 1 and 2 on the 3, 6 and 9 MHz bands. 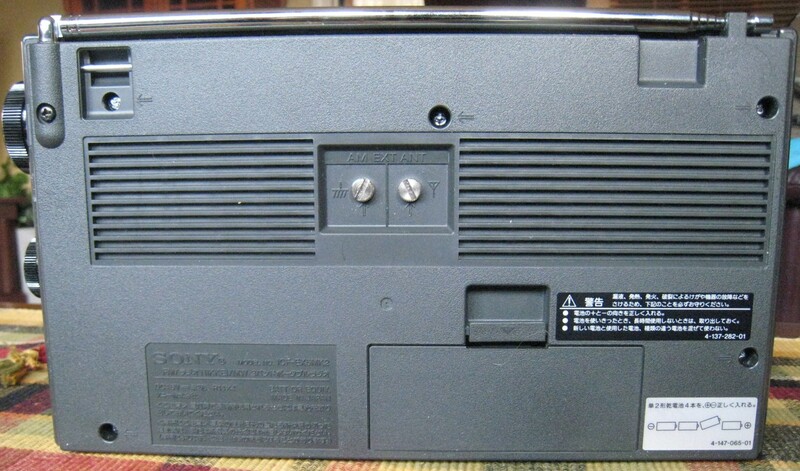 So for the rest of the world this is an AM/FM, analog-tuned radio. But that’s OK…the EX5’s strength is its AM performance. Perhaps the most unique aspect of the ICF-EX5MK2 is its unusual and superb synchronous detection circuit and in my tests it is this sync function which sets the radio apart from the other top AM radios I have compared it to, including many with excellent synchronous detection capability such as the Sony 2010, Grundig Satellit 800 and Eton E1. I will explain why the EX5’s sync is so special later in the review. Out Of The Box: I was dismayed to find that there was something loose and rattling around inside the radio when I received it. My worst fear was that it had been damaged in shipping, yet both inner and outer boxes looked perfect. Luckily I found that the speaker was not mounted properly…it is held in place by a combination of tight-fitting plastic tabs, glue and a metal bar as you can see in the pictures…it would take a great deal of force to break this free and I suspect it was simply not snapped into place properly during assembly. 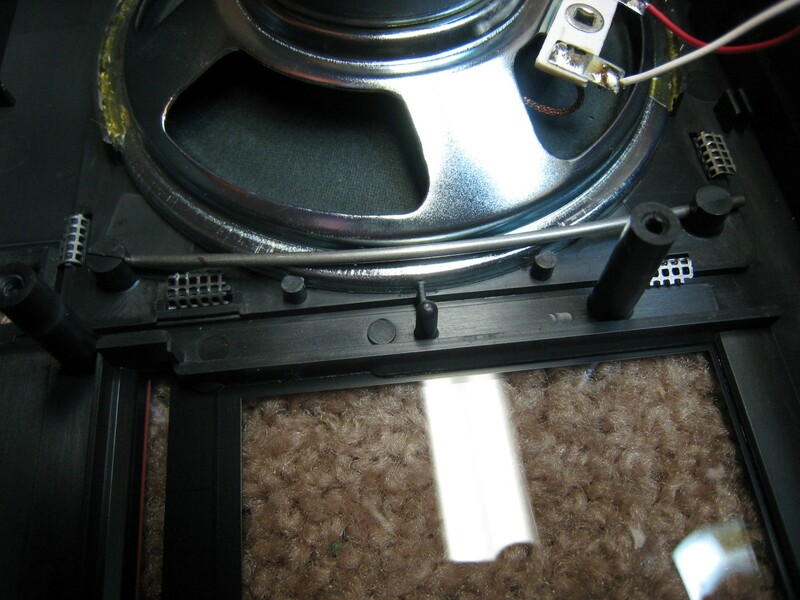 No damage done… after remounting the speaker everything checked out OK. Whew! 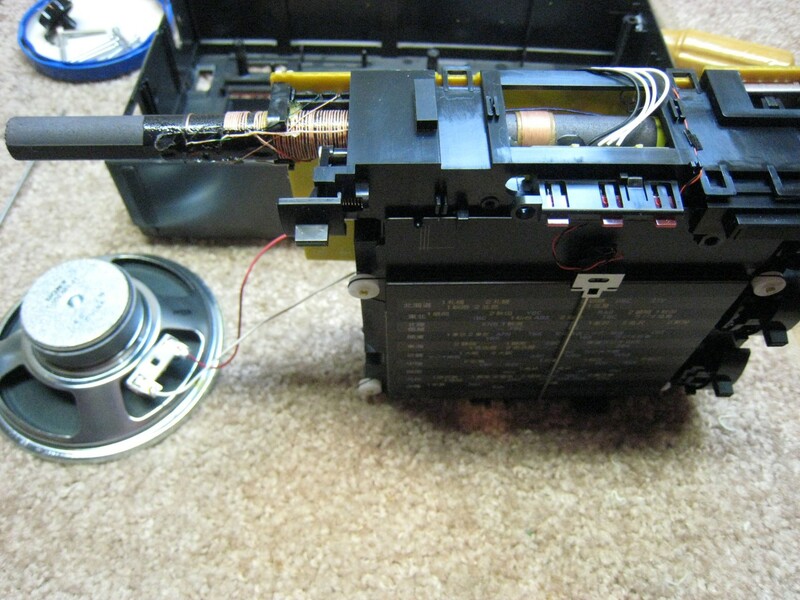 BTW…after removing the 6 screws on the back indicated by arrows you must also remove the two antenna screws to take the radio apart. I compared the ICF-EX5MK2 with several of my best AM portables, including the Panasonic RF-2200, GE SR1 and 2, CC Radio-2E and CC Radio-EP-Pro, Zenith Royal 755M, and several sync-equipped radios including the Eton E1, Grundig Satellit 800, Sony 2010 as well as a few others. The EX5 acquitted itself well…on AM it is indeed very sensitive and has a low noise floor. It was a small notch below the RF-2200, CC-2E and CC-EP-Pro in this regard but it was quite close and would be difficult to discern under less than ideal conditions. This was no surprise because much of what I have researched concerning this radio rate it as unusually sensitive. It is near the very best in this regard but it was beat out in raw sensitivity by the RF-2200 and CC Radios which were able to render most medium to weak signals with less background noise and greater clarity while the very weak (trace) signals were consistently more readable and easier to understand on them. However , the EX5 is still superb and an easy match for every other hot (very sensitive) radio I matched it against, which means I consider it to be Top Tier…it was approximately equal to the GE’s, the Zenith and a few others in raw sensitivity. However the results changed when I began doing selectivity comparisons. At first the EX5MK2 was running neck and neck with my best sync-equipped radios. One of the great benefits of synchronous detection is the ability to listen to the clearer of a station’s two sidebands. So if you are trying to listen to a signal on 840 KHz but it is being interfered with by a neighboring signal on 850, you tune to 840, engage lower sideband sync, and the interference magically disappears. There is a lot more to know about synchronous detection but for the purposes of these comparisons, this enhanced selectivity is the key point. On many such selectivity tests, all the sync-equipped radios worked admirably, and outperformed all the non-sync equipped radios. However, as the interfering signals grew stronger in relation to the desired signals, it became more difficult for the radios to separate them as you would expect, but the EX5MK2 shone by outperforming all the other radios under these more extreme conditions. On one of my most severe tests, trying to separate a very weak distant signal on 1350, adjacent to a local signal on 1360, the EX5MK2 beat all the other radios in its ability to hold sync lock and deliver the desired signal with a minimum of interference. It was not able to succeed completely on this admittedly tough test…I would say the interference was reduced about 90%, but on this test none of the other radios matched it, and often had trouble locking into sync mode at all. This is truly remarkable performance. It also means that the more strong, crowded signals you have, and especially if trying to separate foreign signals on more closely spaced frequencies, the EX5 may be a breakthrough for you in the realm of selectivity in portable radios. Why is this so? I believe it has to do with the EX5MK2’s relatively unique homodyne synchronous detection. You can do an internet search to study this technology but I will describe how it “feels” as implemented in the EXMK2. Most radios with synchronous detection have a distinct “lock” when engaging sync. That is, you tune to a signal, engage sync, and the radio locks onto the signal and enters sync mode. Ideally this is virtually instantaneous, but some signals are more difficult to lock onto, either because they are very weak, or because they are being badly crowded by neighboring signals, interference or fading. On some tough signals you will not be able to use sync at all…the radio just will not lock in to sync mode. Some radios lock onto and hold sync lock much better than others, but the EX5 does not seem to ever be out of lock. That is, when you can hear even a trace of a signal and you turn the sync on, the radio is instantly in sync mode and perfectly locked unless you tune off a signal almost completely. It never seems to lock or unlock, and thus seems to improve signals when other radios won’t lock into sync mode at all. Also, in some tests, the other radios did lock but produced spurious tones or gross distortion when they didn’t lock properly…these artifacts seem totally absent on the EX5MK2. If you engage sync, the sync is on and it never seems to deteriorate a signal until you tune so far off of it that you are hearing only the splatter of its sidebands. This is completely unusual in my experience and it is the one truly unique superiority of this radio over the others I have compared it to. I should also add that the radio has only one IF bandwidth but even so, the sync circuit helped it beat every other portable radio I compared it with for selectivity under extreme conditions. Further, this ability to lock onto almost any receivable signal sometimes increases the apparent sensitivity of the EX5MKII on weak signals. Further, the sync is unusual in that you can tune across a signal and hear a different portion of its audio passband, greatly altering the tonal balance and giving you even more control of interference, noise and distortion. It is the only radio I have that acts this way in sync mode. The only unfortunate omission here is the lack of a Dual Sideband Sync mode…this is needed in some cases, such as when listening to an AM IBOC station…IBOC stations produce a rushing or rumbling noise in Upper or Lower sideband sync mode on all sync-equipped radios. Audio Performance: I have read several rave reviews of this radio’s sound quality but I don’t think sound quality is one of its strengths. It’s rather mediocre in this regard…mostly midrange with little bass or treble extension through its speaker, which is great for reducing apparent noise but it is not what I would call wide range audio compared with many other radios. In fact most of the other radios in these tests sounded richer and fuller on a side-by-side comparison, but for me the Sony is not about sound, it’s about AM RF performance. No radio does everything best! Linear AM Dial Scale: Another feature of note is the linearity of the AM dial scale. As you can see, the frequencies are evenly spaced along the dial, rather than being squeezed together at the top of the dial as is usually the case. That means it is no more difficult to find, say 1550, as opposed to 650…a nice touch and one which most analog radios lack. The dial calibration on my sample was just about perfect as well. FM Performance: Nothing special here. Decent sensitivity, but selectivity is well below what many radios can deliver. In my suburban location I can receive signals on most FM frequencies from several cities but the Sony misses many signals I can easily separate on other radios. Conclusions: The ICF-EX5MK2 is an AM DXer’s dream because of its great sensitivity and extreme selectivity, which is made possible mostly because of its singularly effective synchronous detection circuit. While it’s not any more sensitive than any of several sensitive AM radios I compared it with, and perhaps a small notch below the RF-2200, it is the most selective portable AM radio I have ever tried, even with its single bandwidth. 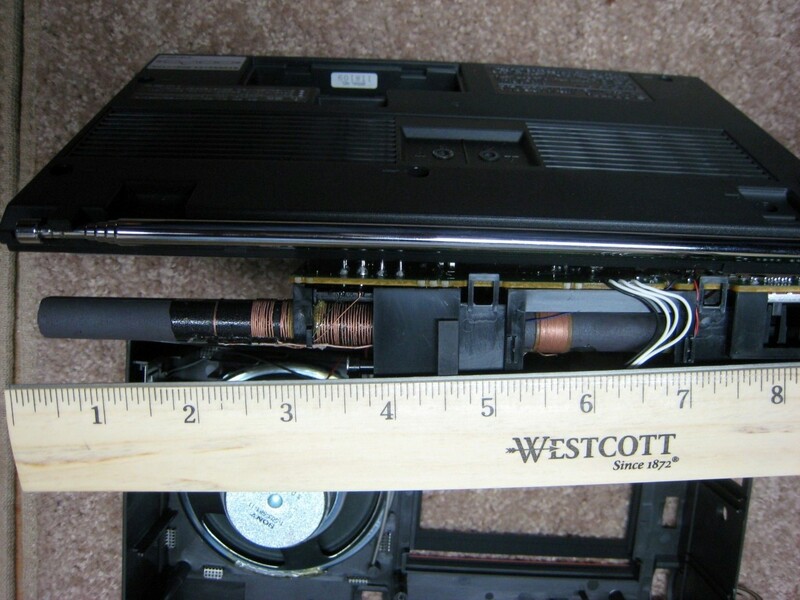 Also be aware that it does not allow you to disconnect the internal ferrite rod for AM when an external antenna is used, and for some users that will rule it out of consideration, but as I said, NO radio is best at everything. And remember, the SW will not work (except for its 6 pre-tuned frequencies) outside of Japan. But it has one carved a nitch that puts it at the top of a short list of excellent AM portables. If extreme selectivity is of great value to you, it’s worth trying one out. And…it’s kind of cute too!